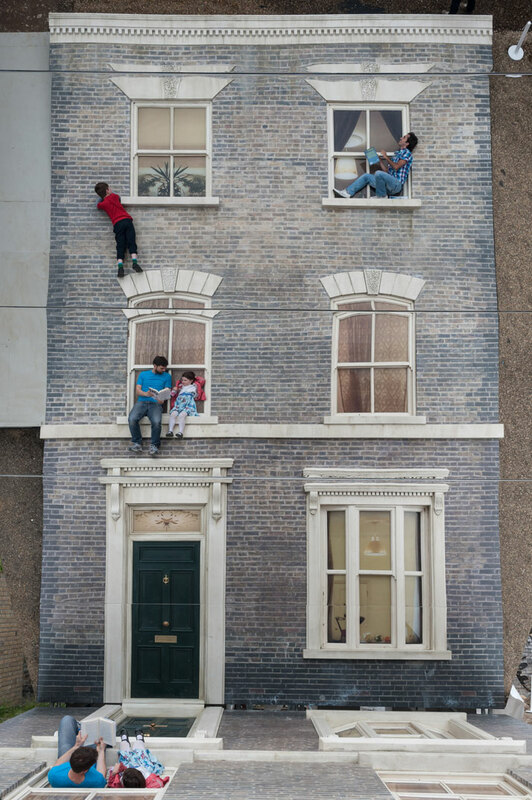 Argentine artist Leandro Erlich is the architect of the uncanny. Internationally known for blurring the lines between the real and the illusory, he skillfully constructs mesmerizing three-dimensional visual illusions that unexpectedly disrupt our notions of reality and space. Born to a family of architects, it was only natural that he went on to develop a fascination with the way in which we perceive, experience and inhabit space and the world around us. His installations challenge our familiar notions of space itself and disturb the perception of our environs by constantly breaking the boundaries of spatial reality where to experience his work, is to abolish all sense of spatial reality all together. 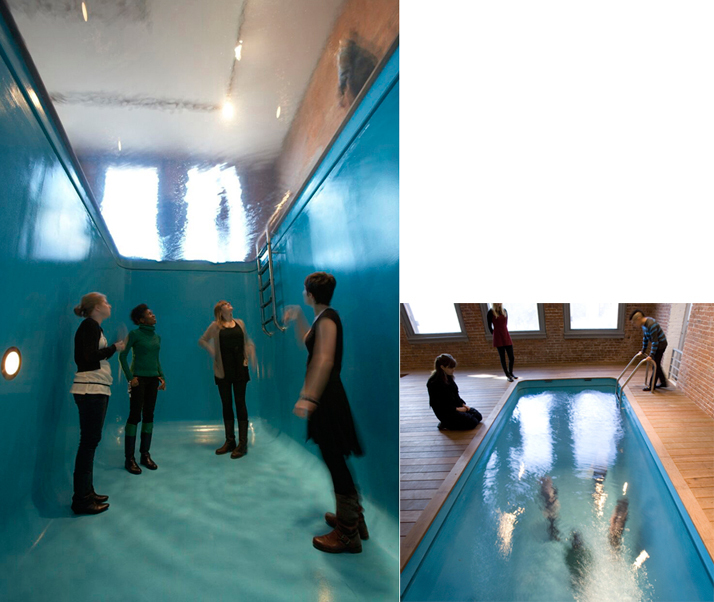 So whether appearing to be submerged under water while remaining completely dry in the ‘Swimming Pool’ (1999), strolling down an old elevator shaft that has been turned 90 degrees in ‘The Shaft’ (2011), or sitting in an apartment that revolves like a fairground ride in ‘Carousel’ (2008), those who witness Erlich’s work are continuously left somewhat mesmerized, baffled and disorientated. 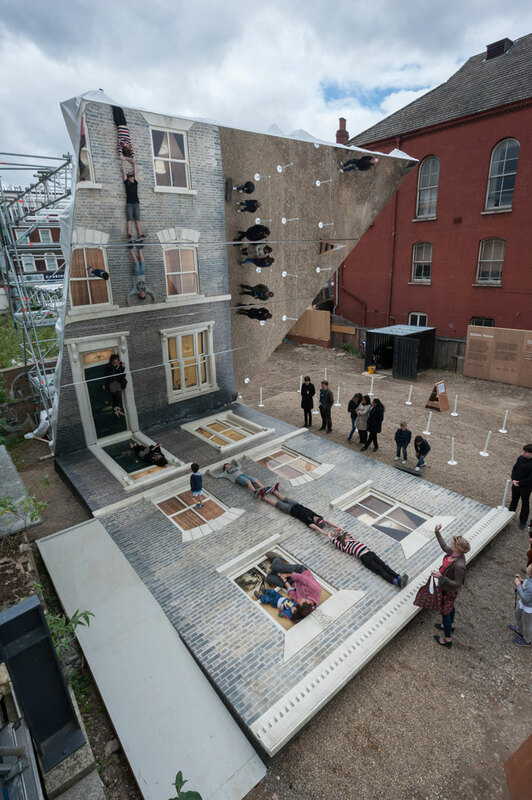 His latest installation, the impressive ‘Dalston House’, now promises to offer the very same effect. © Gar Powell-Evans 2013 Courtesy of Barbican Art Gallery. 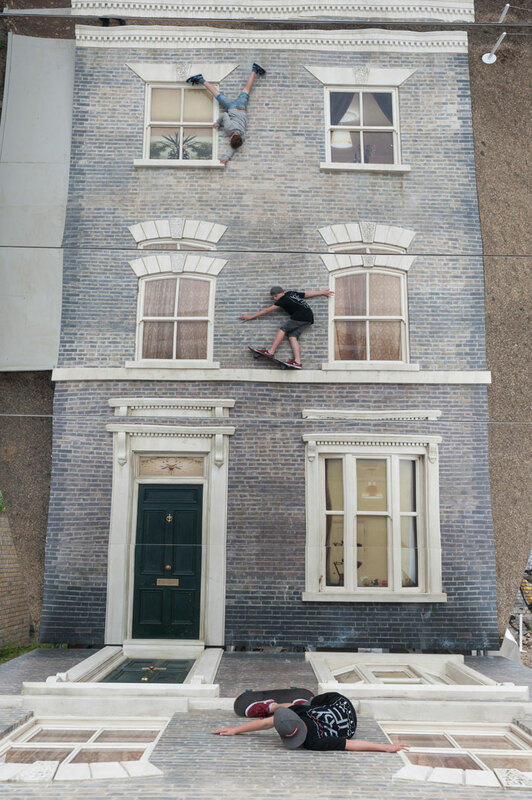 Commissioned by the Barbican as part of ‘Beyond Barbican’, a programme of events outside the walls of the Centre that includes pop-up performances, commissions and collaborations across east London, Dalston House is a mind-bending installation in Hackney that allows visitors to ''walk'' on the façade of a Victorian building. 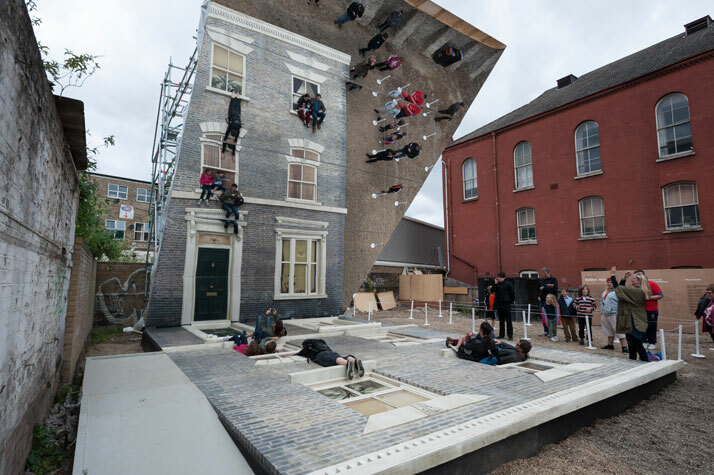 Installed on a disused lot located at 1–7 Ashwin Street that has largely remained vacant since being bombed during the Second World War, the installation downright resembles a movie set. 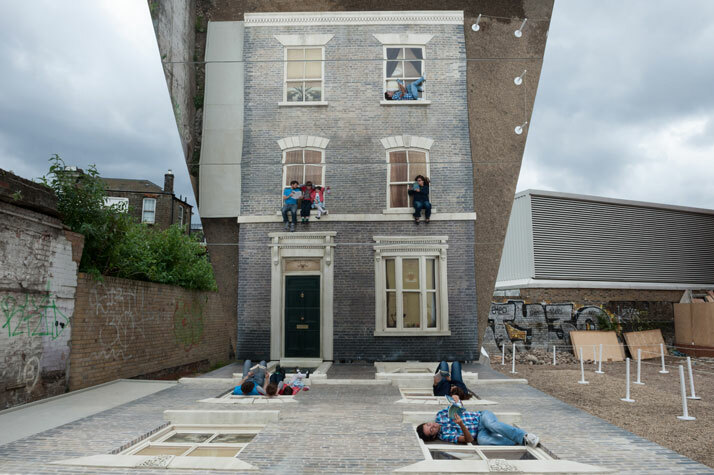 Taking inspiration from the houses that previously inhabited the lot, Leandro Erlich has recreated a life-sized façade of a late nineteenth-century Victorian terraced house – complete with a door, windows, mouldings and other architectural details – and laid it flat on the ground, creating a horizontal plane with a mirrored surface positioned overhead at a 45-degree angle. 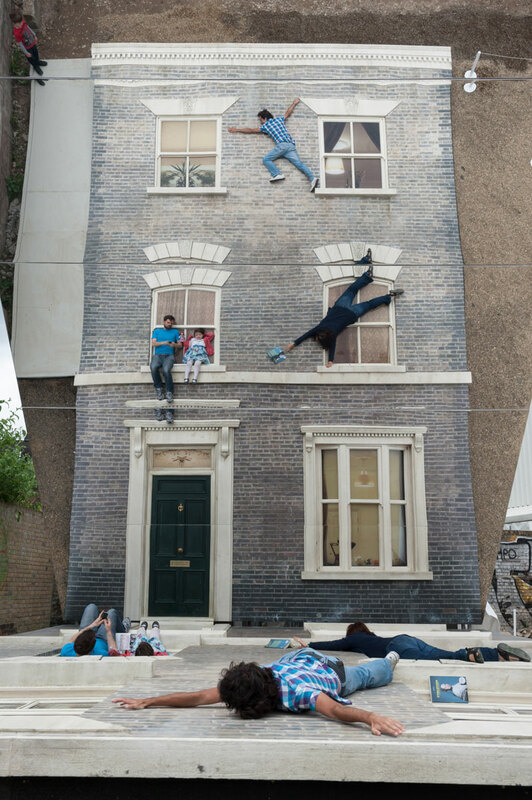 By sitting, standing or indeed lying on the façade, visitors appear to be scaling or hanging off the side of the building, seemingly defying gravity and any sense of spatial reality. Erlich’s unique manipulation of reality is partly inspired by the surreal and sinister aesthetic strategies from masters of the unreal such as Alfred Hitchcock, David Lynch, Luis Buñuel and Roman Polanski whom, as he says, ''have used the everyday as a stage for creating a fictional world obtained through the psychological subversion of everyday spaces''. 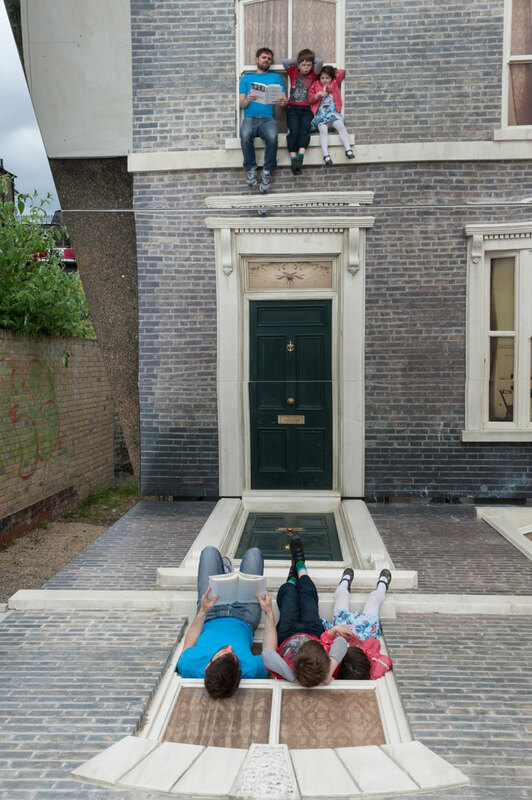 In this vein, Dalston House becomes a bizarre theatrical spectacle where the audience’s participation shapes and transforms the everyday into a whimsical show. In fact, throughout Erlich’s work, the audience has constantly played an active role in bringing his installations to life, becoming the central protagonist of his work. By radically shifting the premise and foundation of the viewer’s long-formed relationship with familiar spaces, Erlich playfully disrupts our own notion of reality, introducing a series of spatial possibilities and situations that would otherwise be impossible to perceive. 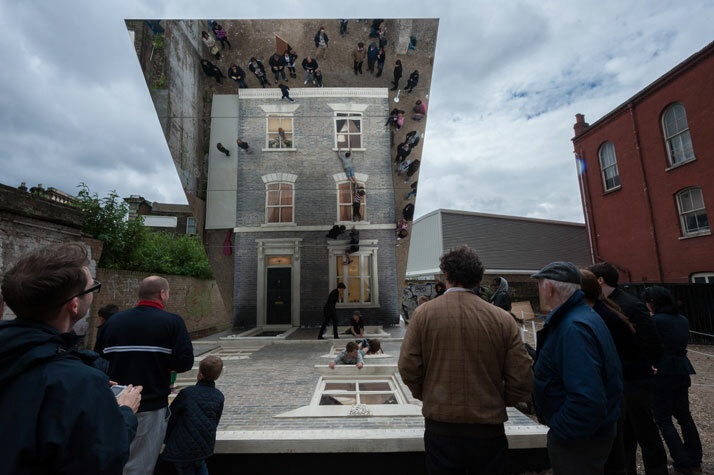 In all its illusory absurdity, Leandro Erlich’s Dalston House becomes the perfect manifestation of his uncanny architectural and cinematic fantasies. 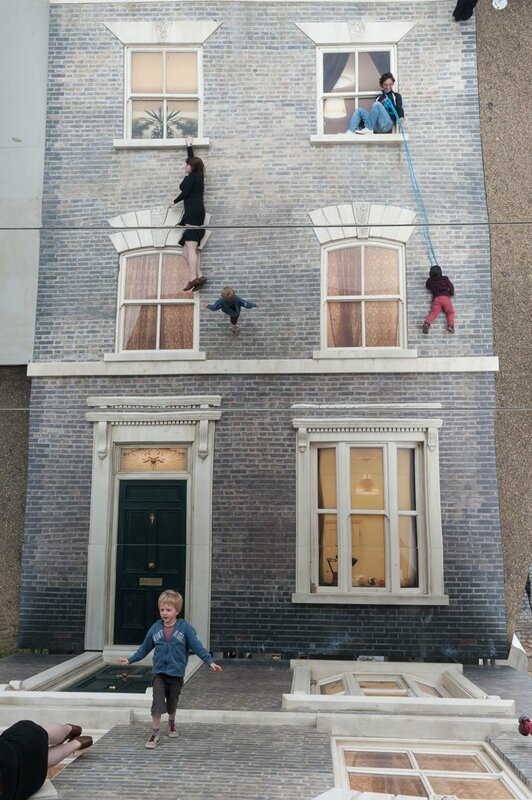 So, if you’ve ever found yourself marvelling at captivating movie stunts where stunt men climb up buildings defying the laws of gravity, you have until the 4th of August, 2013, to experience his installation andimagine what it would be like to be Spiderman for a day.